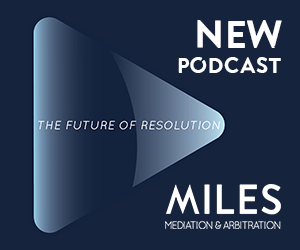 ATLANTA, June 12, 2018– Miles Mediation & Arbitration announced the official launch of “The Future of Resolution,” a podcast focused on alternative dispute resolution (ADR), the art of conflict resolution, legal news, and emerging trends. The eight-episode podcast features interviews with notable legal professionals who have had a significant impact on Georgia’s legal community and beyond. Miles CMO Marcie Dickson serves as the podcast’s primary host, with several Miles neutrals also leading discussions throughout the first season. In the first episode, “Miles and The Future of Resolution,” Miles CEO John Miles shares his perspective on the future of alternative dispute resolution. In the second episode, “Unmasking the Arbitration Bias- Part 1,” Miles neutrals Jennifer Grippa, Esq. and Stephen McKinney, Esq. explore the benefits and pitfalls of arbitration. Future episodes include interviews with Leah Sears Ward, former chief justice of the state supreme court; Wade Malone and Nekia Hackworth Jones, representing Atlanta Bar Association’s Summer Law Intern Program; and much more. For media inquiries or to nominate a guest for the “Future of Resolution” podcast, please email podcast@milesmediation.com.